FYI — Next pod­cast will be less philo­soph­i­cal and more instructional/practical. Thanks as always to Vlad,‚Andre_f,‚deb­bieT, ‚Elio and Alen for‚recent com­ments and sug­ges­tions. We LOVE com­ments and sug­ges­tions so please send more. Pho­tog­ra­phy pod­cast #41 offers a primer on his­tograms in dig­i­tal pho­tog­ra­phy. A his­togram is just a graph show­ing the dis­tri­b­u­tion of tones in a pho­to­graph. We dis­cuss how to ‘read’ his­tograms and how much atten­tion we should pay to them. The images above reveal the his­tograms asso­ci­ated with them. Notice how in the right pho­to­graph there is still tex­ture in the white in the dog’s face and in the sand. 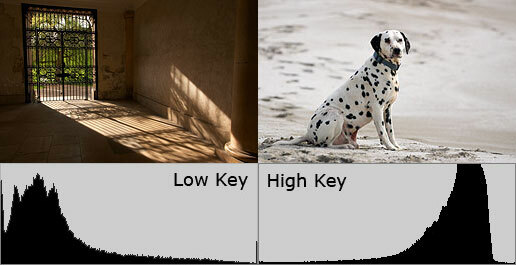 If the his­togram was closer to the right edge we’d lose detail in the dog’s face and start los­ing detail in the sand. Thanks as always for the com­ments and sug­ges­tions. We LOVE com­ments and sug­ges­tions so please send more.